The residents of five counties, 1.4 million in all, rely on the primary healthcare service provided by WellStar Health System of Georgia, USA. This non-profit organization runs five hospitals, six urgent care centers, a skilled nursing home, two in-patient hospices and over 100 medical practice groups. The WellStar organization has over 1,300 beds. Each year it generates nearly 11 million lbs. (5 million kgs) of linen to be laundered and as with any healthcare laundry, correct processing is a crucial component of total patient care. These laundries expect the linen to be clean, chemically balanced and to last as long as possible. Running out of clean hospital linen is never acceptable. Sending linen for re-wash or replacing it because it is ripped (or irretrievably damaged) is expensive. Therefore hospital laundries need to employ reliable and durable machinery. For over 65 years, Pellerin Milnor has been synonymous with reliability and durability. Since 1979, Milnor's CBW® tunnel washers have been used in healthcare laundries because they can process thousands of pounds (kilos) hourly. Thirty years after producing its first generation CBW tunnel washers, Pellerin Milnor has introduced the revolutionary PulseFlow® Technology. 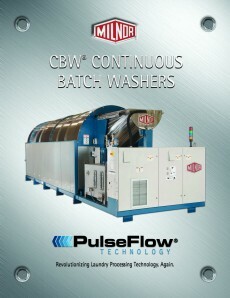 The PulseFlow tunnel retains the key components of the successful and proven CBW tunnel. These include a true top-transfer function, the counterflow principle, a design without seals between the modules and the use of standing baths. The main differences between the conventional CBW tunnel, which has proved to be an industry mainstay, and the PulseFlow tunnel are the way in which the counterflow interacts with the linen and when it is introduced into the wash cycle. In the PulseFlow system, the intermittent counterflow and RecircONE® pump continuously pump water in the first module. This allows PulseFlow tunnels to achieve an unprecedented reduction in fresh water use – consumption can be as little as 0.3 gallons/lb. (2.5liters/kg) for lightly soiled linen. Many have speculated how this technology can maintain the wash quality for which Milnor is known. Even WellStar's scrupulous management team – Walter Grueninger, director of supply chain operations, Thurman Geathers, maintenance supervisor and James Goodwin, plant manager – was doubtful at first. Then David Carter, senior sales representative at Milnor's local dealer Tri-State Technical, explained in detail how PulseFlow works. Once on board with PulseFlow, the team agreed on the following equipment mix: An eight-module 76028 PBW™, an MP1540 40bar single-stage press and four Milnor 64058 gas-heated pass-through dryers. Milnor's applications engineering department and Carter worked with WellStar to design the laundry for maximum efficiency. From rigging to startup, the entire project came in under budget and ahead of schedule. 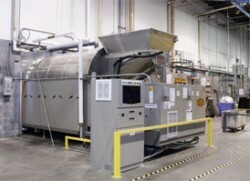 WellStar says that the PulseFlow tunnel is a “sleek, efficient beauty that serves as an incredible workhorse, meeting and exceeding the expectations of this knowledgeable and demanding laundry team.” The company added that “the workhorse” has doubled the entire laundry's productivity, from 15 to 30 transfers of 3,300 lbs. (1,500 kg) an hour. WellStar's laundry employs 44 full-time production staff (30 clean-side, 14 soil-side). The operating hours are from 4:00am until 2:00pm, but because the PulseFlow tunnel is so efficient, it is often turned off before noon.